Description: Catch up with Kary Osmond, the host of CBC Television’s show “Best Recipes Ever” as she explores Canadian Living Magazine’s recipe library and cooks up mealtime solutions for busy home cooks. For 35 years, Canadian Living has been developing creative meal solutions for Canadian families. Whether you’re entertaining or eating a family meal on Wednesday night, the Test Kitchen has meal solutions that taste great and are easy on the cook. 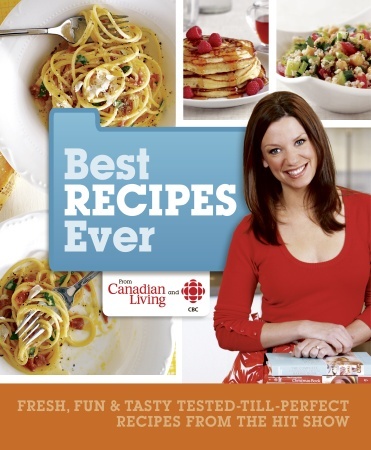 This collection showcases all of the recipes featured in the show’s first and second seasons. Peppered with helpful tips and friendly advice, it gives readers the tools they need to make delicious, low-fuss meals at home for any occasion. Hmm I'll have to bug you and see if you can bring this in for me to peruse! It sounds yummy!